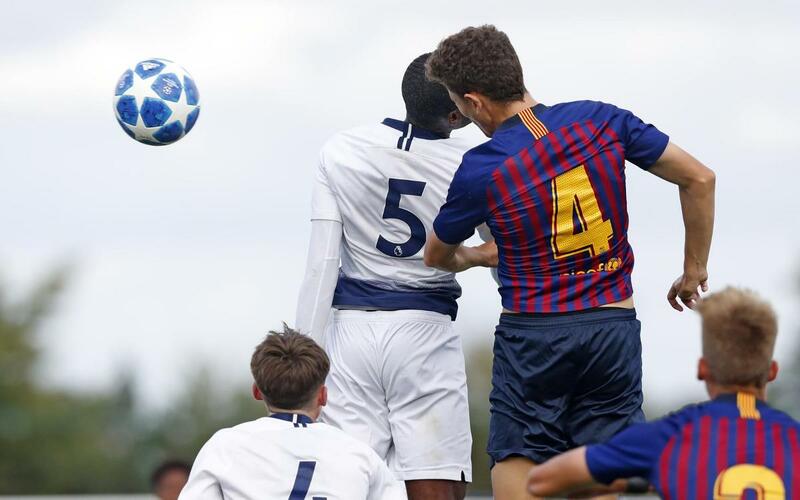 Denis Silva’s U19A side secured a 1-1 draw against Tottenham Hotspur in London in the second fixture of the UEFA Youth League. The central defender Rojas but the blaugranes ahead after 25 minutes but Richards levelled for the home side just before the break. Both sides fought hard in a tight game but neither was able to come up with the winner. In the opening minutes, the home team controlled possession and they created the first chance of the night. In a counter attack from a Barça corner, Richards wasn’t quite able to convert a promising move. After 25 minutes, Barça’s U19A side took the lead as the captain Guillem Jaime floated in a free kick which Rojas headed past Austin. The goal gave them confidence but Tottenham pegged them back with half-time almost there. Richards got the goal. The second half was close and Barça had chances. In the 64th minute, the blaugranes saw a great chance go begging as a Hinds clearance hit his own post. Five minutes later Nil Mortimer almost put his side ahead from a flowing passing move. Despite the lack of goals the U19A side continued pushing for the winner up to the very end. In fact, they almost scored in the 94 th minute but Fati’s effort whistled wide of the post. The match ended 1-1 with Denis Silva’s players earning a valuable point as they remain top of the group on four points after two rounds of fixtures.